In our STEM Teachers of TPT Back-to-School blog hop we set the stage to promote a mind-set for keeping students engaged and motivated to learn. I know you have been assigning tasks that are challenging and achievable, but is there a noticeable decline in student dedication to that goal at mid-year? With the rapidly approaching holiday season many educators are faced with a daily challenge to keep our students focused. Maybe they have lost sight of their goals. 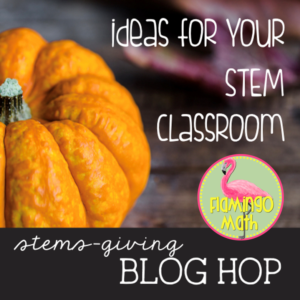 Be sure you visit each blog post in this MID-YEAR STEMSGIVING BLOG HOP. There are opportunities to win products and a $50 Amazon Gift Card Giveaway. My STEM friend Weatherly on TPT will be giving away two products. 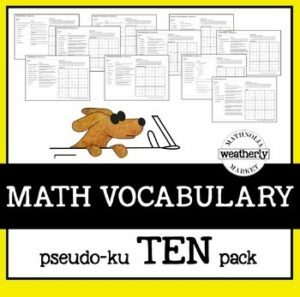 You can enter for a chance to win her Pseudo-Ku TEN Pack Vocabulary by leaving her a comment at the bottom of my post. Simply tell her which product you would like to win and WHY! She says, “Going over terms can be boring, but with this Sudoku activity, students will be reviewing vocabulary without realizing it” …. 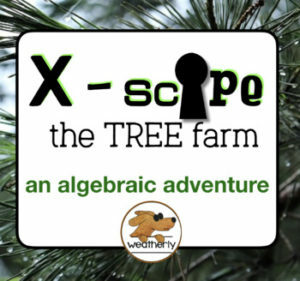 She also has an ESCAPE the TREE FARM Activity for Algebra students as a great motivation. Be sure to leave those comments below to be considered for this prize. Let me share another technique that has proven effective in our school year-after-year. Our skill-builder activities help students work toward quarterly goals, and promotes a growth mindset. Each quarter, my colleague and I create a set of “GATEWAY Skill-Builders” that help to motivate student learning. Students have a new goal – with a purpose – each quarter for the hard work they do. Secondary math students need motivational help to learn math facts related to future lesson concepts, such as exponent laws, domain, unit circle values, exact values for trigonometry, derivatives and integration skills. For students with a fixed mindset, it is difficult to persuade them to strive to challenge themselves, to work hard and improve their basic skills. GATEWAY Skill-Builders provide a safe approach which allows room to struggle and a pathway to success. Each quarter we design a set of “GATEWAY Skill-Builder” sets of computational drills or memory-recall sets. Students are given 10 to 15 minutes to complete the skill-set. We use this skill-set as a quiz grade, which proves motivational since we require a perfect paper before scores are recorded. Those students who chase grades before knowledge know the value to their quarter grade will improve once they master the concept for the quarter. Who doesn’t love a 100%? 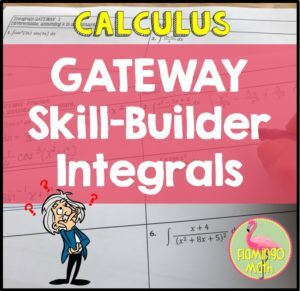 To set the stage, first let me say that it takes about 100 minutes of instructional time each quarter to use this Gateway Skill-Builder strategy. There is one practice day, with time to work through the solutions, and then three different timed sessions, of 10-15 minutes each, every two days. If you start the set by the second week of a grading period, students have plenty of opportunities to master the skills. Start with a Practice Gateway to set the tone and expectations. When time is called, work through each question and discuss concepts that might lead to incorrect answers. Students should keep this practice set as a study aid. Explain that in two days they will have their first timed quiz to master the skills. If they do pass on this first try, you can offer a bonus of 105% as a quiz grade. Then, two days later give them another try for 100%. Finally, there is one more “in-class-timed-event” to make a perfect score. After the three class sessions, students may attempt the Gateway either before or after school. On average, it takes most students between 5-8 attempts for perfection. Now, you might be thinking, “How in the world do you grade this many papers?” Trust me, my colleague is a genius at this, his plan works like a charm. After each timed quiz is given, we ask that anyone who feels they may have a chance for a perfect score to surrender their paper. There will only be one or two who feel confident. Then, all pencils must be put away and a red or green pencil to grade is needed. NO EXCEPTIONS! You can display the answer key or call for answers. Be sure to have students record a score on their paper and turn the graded paper in. Do not allow students to keep these graded attempts. I will mention here that we have student helpers who file these unsuccessful attempts into individual student folders as part of service club hours. Every now and then it becomes necessary to record the highest score for some students who haven’t stepped up to the challenge. This is the reason we file the attempts into a student folder for referencing, if needed. It is best to create about 10 versions for any given skill set. By doing so, your students can attempt a perfect paper all quarter long. Be sure to choose a deadline for any last chance about a week before the end of the quarter for your procrastinators. If you can implement these “Gateway Skill-Builder” sets in a vertical teaming effort within your school, your students’ knowledge base will improve. Teachers for each course afterward will notice they have fewer review days. WE ARE SO THANKFUL FOR STEM TEACHERS! BE SURE TO ENTER OUR GIVEAWAY! TWO WAYS TO WIN . . .
Leave a comment below telling me (a) what skill-builder concept would help your students succeed? ; and (b) what product in MY TPT STORE (<$10) would help keep your students motivated? I will randomly select a winner, and will email the product of your choosing. For even more opportunities to win, check out these fabulous blog posts! I’ve teamed up with each of these amazing STEM teachers to write posts about keeping engagement high and students motivated at this time of the year. Each blog post will have another chance to win, so make sure to check them out! Carolyn at Engaging Science Labs shows you an amazing hands-on periodic table for the science teachers. 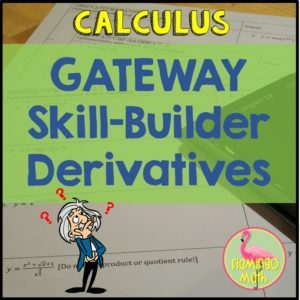 a) Any of your Skill-Builder for Calculus (Derivatives or Integrals) would be great for my AP Calc AB and AP Calc BC classes. b) I’d love a copy of your Calculus: Turkey Showdown Activity. This will be a great review before Semester 1 Final. A) I like the vertical building of skills. b) I would like the trig functions activity. I rarely get to trig functions in Alg. 2 because there is so much reviewing needed from other courses and we are on block scheduling. You were chosen a winner for Weatherly’s giveaway. Can you send me an email at jean@flamingomath.com to receive your prize? Hi Jean, I like all your products, very well done. 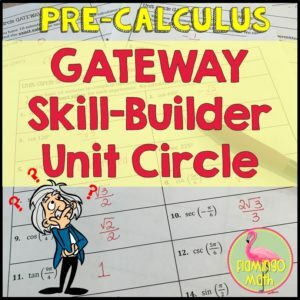 I would love any of your gateways, and the Pi Day Activities for Secondary students. Thank you! 1. I really like to use your practice set of your Skill Builder bundle before a holiday break. This will leave them with a taste of what they need to know to eventually earn a 100 on the skill builder quizzes. 2. 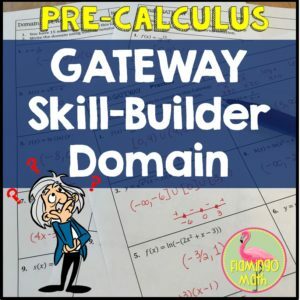 I would love to have the Skill Builder Precalculus Domain Activity. Some of my students are still having trouble finding domain values of a function (although they are getting much better). This would be a great incentive to practice a little bit more to earn a 100 quiz grade. @Weatherly, I’d love to have my students try your Radical Equations with 2 Radicals Task Cards, especially for my Preap kids I’d love to challenge them with your H.O.T. approach. a.) 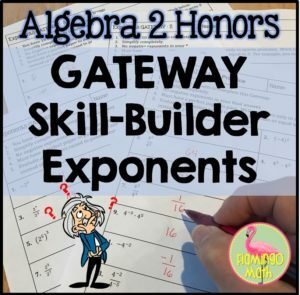 I would like to try the Skill builders for Algebra II. I think it would be an awesome way to motivate some of my students. b.) My students like all of your task cards and activities. We use several of them! I really liked the vocabulary review from weatherly on tpt but as I was looking at it and also decided I must try the domain and range spoon review activity too. 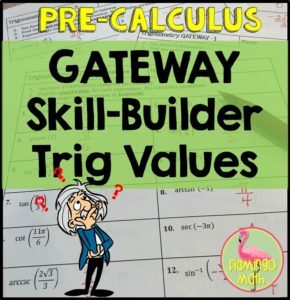 A. I would love to win the Trig Values Skill Builder! I am working up to purchasing all the skill builders. B. From your store I would like the Position, Velocity, Acceleration stations activity. Thanks. Have a Happy Thanksgiving! Using movement as much as possible to keep the kids motivated.